Somerset Activity and Sports Partnership staff were privileged to share their evening with 160 people on Friday 19th October for the annual Somerset Activity and Sports Awards at The Cooper Associates County Cricket Ground, Taunton. 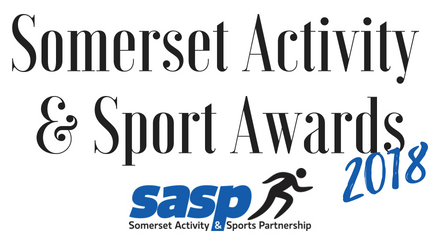 The awards, organised by Somerset Activity & Sports Partnership (SASP) are an opportunity to celebrate the achievements and successes of the inspirational volunteers, great coaches, outstanding athletes and quality clubs from across the County. Jane Knowles, CEO of SASP, gave a warm welcome to proceedings before introducing host Ben McGrail, West Country Correspondent for ITV who was back to oversee things for a third year. This year saw over 80 entries for awards across 12 categories, all of which highlighted the fantastic work going on in the County. Categories and awards also reflected the physical activity agenda along with sports development. Jane Knowles said; 'as a County Sports Partnership we feel it is important to recognise the tireless efforts of our fantastic workforce. Volunteers are the backbone of community sport and we know that without them sport cannot function. Great coaches not only support athletes to realise their potential but help to create an important lifelong love of sport and physical activity'. Winners on the evening included Dawn Self, Sally Lukins, Jodene Hall and Rhianne Cooper from Somerset Striders Running Club who won the Get Somerset Award. They have created a supportive community that people feel proud to be a part of, one with no judgements, a welcoming atmosphere and make getting active fun. There is no pressure to do anything other than what you want but they all apparently seem to have the knack to encourage you to challenge yourself! From not being able to run for 30 seconds to now completing a marathon, they literally get Sedgemoor Striding! In its 2nd year, the Sports Performer of the Year Award went to Sam Cobb who has been busy on a world stage with lots of the different events that come under the Modern Pentathlon umbrella including Triathle, Biathle and Laser Run. Last year Sam competed at the UK National Championships, the European Championships and the World Championships – medalling everywhere and helping GB to secure many gold medals in the process. Sam is also a county runner for Somerset both in athletics and cross country and is a very successful rider and member of a local Pony Club, as well as being a member of the U15 England Performance hockey squad. Well done to all winners, people who were shortlisted and nominees. We would also like to thank our sponsors for supporting this event.